This Perma-loc tubing fitting is designed to connect poly tubing to layflat hose. You will need to use Irritec's orange handled 14 mm layflat cutter, item# 1791, to make the correct size hole in the layflat tubing. 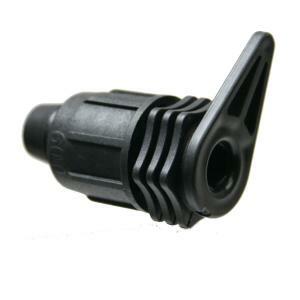 Use the appropriate Tee Handle Hex Tool for installing the fitting into the layflat hose. *Please see the chart below to size the poly tubing to the correct size perma-loc fitting.